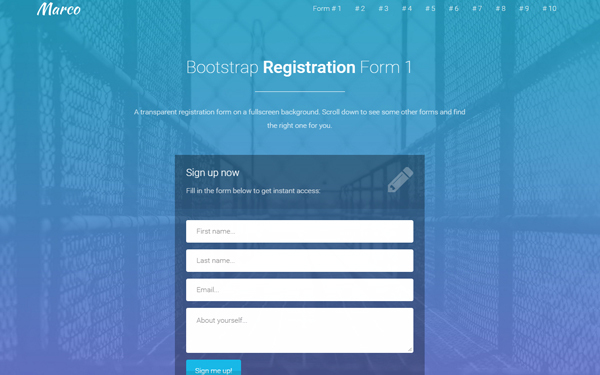 After releasing this Bootstrap form wizard template a few weeks ago, called BootZard, a user left a comment asking how he could add a new step to it. So, today’s article is a tutorial where I explain how you can easily add a new step to this form and I also show what is the algorithm used here. 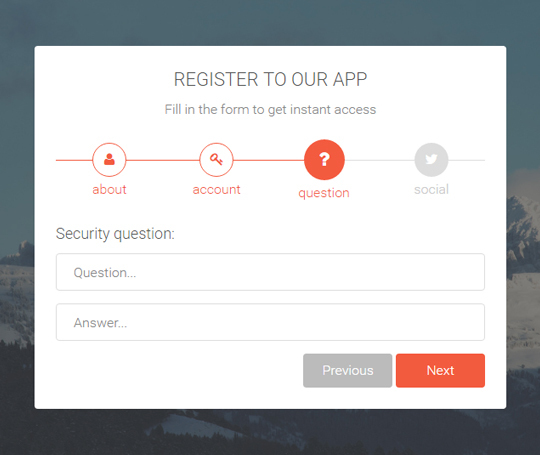 In this tutorial we will add a new step to the form where we will ask the users to create a “Security question”. As you can see, this is a multi-step registration form so it makes sense to add a question like that. <input type="password" name="f1-repeat-password" placeholder="Repeat password..."
First, we change the attributes of the progress bar: the “data-now-value” attribute from “16.66” becomes “12.5”, “data-number-of-steps” from “3” becomes “4” and “style” from “width: 16.66%;” becomes “width: 12.5%;”. The formula here is: 100 / number of steps / 2 (100 divided by the number of steps divided by 2). In our case “100 / 4 / 2” is 12.5. An important note that should be mentioned here, is that you should try to not add too many steps, because the usability and visibility in mobile devices will not be very good. If you really can’t reduce the number of steps, you can try other solutions like, for example, hide the progress bar and the icons with CSS in small screens. We have changed the width value from “33.333333%” to “25%”. At the beginning of the file we have two functions that we use in other parts of the code when needed. The first function “scroll_to_class” is used to scroll the browser’s window to the beginning of the form when the user changes the step (previous or next). The various steps of the form may have varying input fields resulting in different form heights, so we use this function to make sure that the user always sees the beginning of the form when moved to a new step. The second function “bar_progress” is used to move the progress bar to the left or right when the step changes. The remaining code is all commented so it’s not very difficult to understand it. When it comes to the form’s behaviour, we have 3 main events: the user clicks the “Next” button, the “Previous” button or the “Submit” button. Let’s see what happens in the case of the “Next” button. The other two events are very similar. First we create all the variables we need where we store various DOM elements, etc. Next we validate the form. The validation here is very simple, we just check if any field is empty. In that case we add an “input-error” class to the input field and set the variable “next_step” to “false”. If there are not empty fields, we proceed with the next step: we hide the current fields, change the icons’ style at the top, move the progress bar to the right, show the input fields of the next step, scroll the browser’s window to the beginning of the form. As we mentioned above, we only check for empty fields. Depending on the types of forms that you may have in your projects, you may need to add other rules to the validator. Another thing to keep in mind: this is a front-end validator and you might also need back-end validation in your projects. You can implement it in different ways depending on the project requirements. 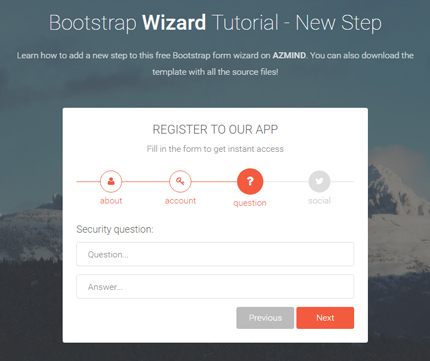 We just learned how to add a new step to our Bootstrap form wizard. We used some HTML code and made a small modification to the CSS file. 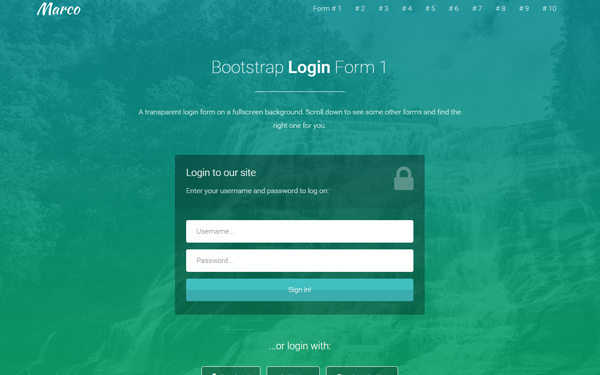 Below you can preview the form and download the source files. Let me know if you have any question or suggestion in the comments. This source code, how is the license for this? In the text it says customize and use as you like. section. but it not applying validation please suggest. Got the same problem. Didn’t manage to find the problem yet. Someone else? I want to add a bootstrap-multi select dropdown with a checkbox: https://github.com/davidstutz/bootstrap-multiselect. Whenever I try to add plugins for it is not working. Can You Please suggest an easy way. Oh I have the same problem, did u find how to resolve This please?